Fantasy Football flew by and you are probably sad. I’m here to tell you that while we, unfortunately, have to wait months for fantasy football, we can start getting prepared for Fantasy Baseball! If you are a veteran or a fantasy football player looking to expand your horizon I recommend points leagues! Not only are they most similar to football in that aspect, it creates rivalries and is simply easier and more fun to root for every night! If that sold you, well you’re in luck because I am going to bring you an entire series on points league values at every position! There are certain things that can make a player better in points leagues than say Roto leagues and vice versa. Steals are a huge category in Roto leagues. But because in most leagues they are only worth two points well… like in the MLB, they just aren’t as valuable. Walks don’t help you in Roto leagues but are a huge part of points leagues. Strikeouts lose you points and you get rewarded for hitting a double. These are the things you need to look for when searching for a points league sleeper! Those without these traits are ones that lead to busts! I will be using a stat you often hear used for pitchers but flipping it for hitters. I will use Batter K-BB%, meaning I will take their strikeout rate and subtract their walk rate. The lower the number, the better the points league hitter, as they will lose fewer points due to strikeouts and gain more due to walks. Those with a higher K-BB% are batters that are less valuable in points leagues. Using K-BB% allows us to use that Rotobias to identify points league sleepers that often fly under the radar. Carlos Santana is my points league bae. Every season I write about him being absurdly underrated in points leagues. Yet, due to Roto Bias, he continues to be devalued in points leagues. Santana doesn’t stand out in Roto leagues, there’s no denying that. Because of that, analysts never talk him up and his ADP on sites is pushed down. Hell, I waited on first base and drafted him as my starter in the Beat Mike Florio draft on Fantrax and couldn’t be happier about that. Last year in a standard 5×5 Roto league Santana finished as the 16th overall first baseman and 115th player overall. Not great. Yet in points leagues he finished as the fifth best first baseman. And before you think it is a fluke, he finished as the seventh first baseman in 2017 and 2016. He has long been underrated. His finish this season is due largely to his -2.5 percent Batter K-BB%. Remember, the lower the number the better the player is in that category. Having a negative result means that Santana walks more than he strikes out. That is exactly the case as he had a 16.20 percent walk rate and a 13.70 strikeout rate. He was one of just five hitters (min. 300 plate appearances) with a negative Batter K-BB%. That puts him in elite company. In fact, his -2.5 percent Batter K-BB% was the second lowest in all of baseball and the lowest among all first baseman. Add in that he has hit 23 or more homers in three straight seasons, and is a near lock for 160 R/RBIs (in points you care more about the total number of those two, not specifically what the hitter provides in each). I also feel like Santana will be more comfortable returning to Cleveland, where he can once again DH. Santana is once again a huge value that allows you to wait on the first base position and still get a top option. Joey Votto definitely was a bust last season. I had him as my top-ranked first baseman, yet he rewarded me with 12 homers, 67 runs and RBIs and a sub .300 average for the first time since 2014. Despite that very disappointing season, he still finished as 12th first baseman in points leagues. That is due to Votto’s -1.1 percent Batter K-BB%. Despite his strikeout rate jumping to 16.2 percent, his 17.3 walk rate was still better. Votto didn’t dominate this stat like he did in 2017, but he was still one of just five hitters with a higher walk rate than strikeout rate. Votto will go off the board as the 10-12th first baseman, judging from early drafts and ADP. Yet, that is his floor in points leagues. We know his ceiling is much higher, especially since a bounce-back is very possible. Votto had a career-high 41 percent hard-hit rate last season, but his fly ball rate dropped from 38 percent in 2017 to 31.1 percent in 2018. If he can lift the ball like in 2017, he can once again finish as a Top 5 first baseman in points leagues. He finished as the top first baseman in 2018 and second in 2016 in points leagues. Anthony Rizzo is not a sleeper by any stretch. But you may be interested to know that he has the third lowest Batter K-BB% of all first baseman at 1.5 percent. That’s all. Miguel Cabrera should not be drafted as a starter anymore. Injuries have derailed his last couple of seasons, but I would draft him as a utility or bench bat, as I’ve seen him go in the 18th round of 12 team drafts. Cabrera had a 3.2 Batter K-BB percent, the fifth highest of all first baseman with at least 100 plate appearances. We didn’t have much of a sample size of Cabrera last season but he did continue to do two things well. He still hit doubles, belting 11 of them in 157 plate appearances. He also had a 46.3 percent hard-hit rate. I won’t overlook the injuries or 20.4 percent fly ball rate, but for a bench bat, I will take that shot in points leagues. Tyler White is one of my favorite breakout picks this season. In 66 games with the Astros last season White hit 12 homers, drove in 42 runs and had a .354 OBP. What I love even more is that he showed good plate discipline with a 20.7 strikeout rate and 10.1 percent walk rate. His Batter K-BB% was 10.6 percent. That was lower than Max Muncy (10.8%), Paul Goldschmidt (12.1%), Jose Abreu (13%) and Cody Bellinger (13%), among many others. While I don’t love his 32.7 percent hard-hit rate, I do love his 42.6 percent fly-ball rate. White is currently projected to DH for the Astros, but saw time at first, second, third, shortstop and left field in the minors last season. I trust that he will see regular at-bats and I am very excited for him. I would take a shot on him both in points and Roto leagues. I do not need to tell you to avoid Chris Davis but he had a 28.9 percent K-BB percent. That is not bad, it is the third-worst of all hitters with 300 plate appearances. Only Jorge Alfaro (36.6 percent) Mike Zunino (37 percent) have higher. You can find them in the catcher bust article. Just stay far, far away. Eric Thames is a player to stay away from in points leagues. Not only does he not see everyday at-bats, which makes him hard to use in points leagues, but he also has a 24.5 percent Batter K-BB rate. Sure, he will have an insane week or two stretch where you will wish he was on your team, but also in your lineup. Other than that you will be happy you do not draft him. C.J. Cron was one of my late round breakout picks last season and he came through hitting 30 homers, just like I predicted he would (appreciate it, C.J.) but he is a much better Roto player. He strikes out too much, sporting a 25.9 percent strikeout rate, is streaky, which you can tolerate in Roto formats but not as much when you need to compete each week, and has a high 19.3 percent Batter K-BB rate. You can stay away this season in points leagues. 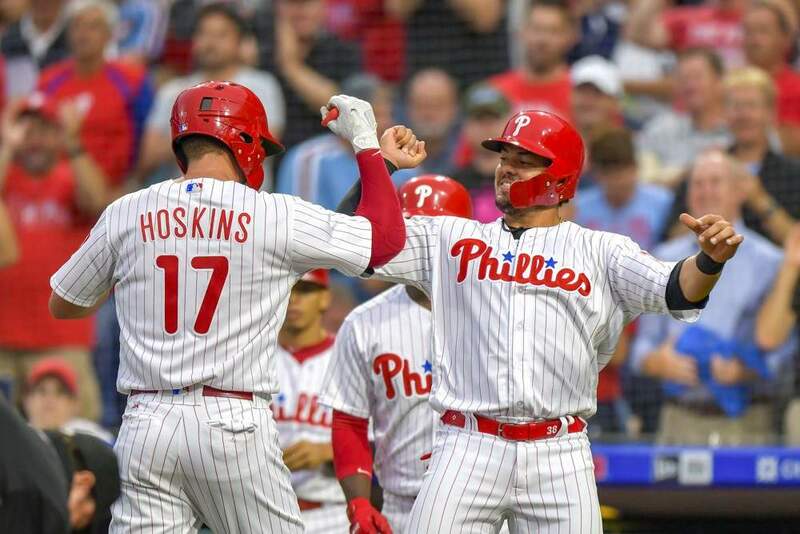 If you like these Points League Sleepers check out the rest of the 2019 FantraxHQ Fantasy Baseball Draft Kit. We’ll be adding more content from now right up until Opening Day. Votto finished as both the 12th and best first basemen in 2018? That’s impressive.